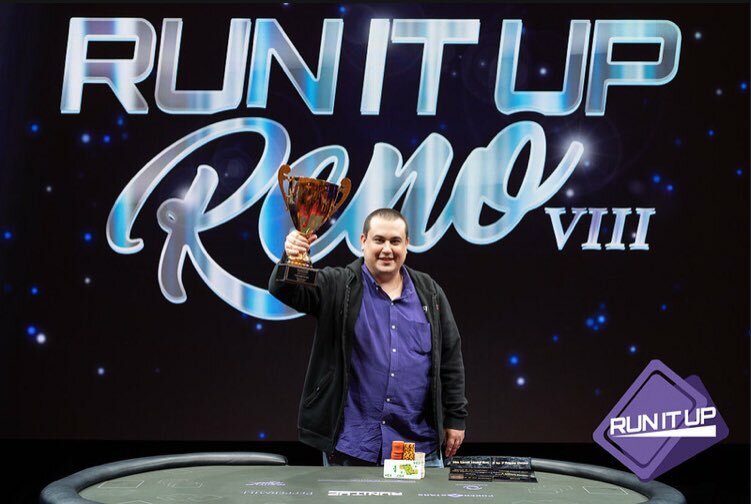 If you can believe it, Day 1 of Run It Up Reno VIII is already in the books after a fun-filled opening day! 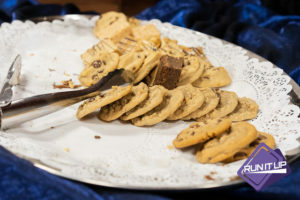 The buzz in the air and on the social media scene is all about this event and will continue to be for the next 11 days. 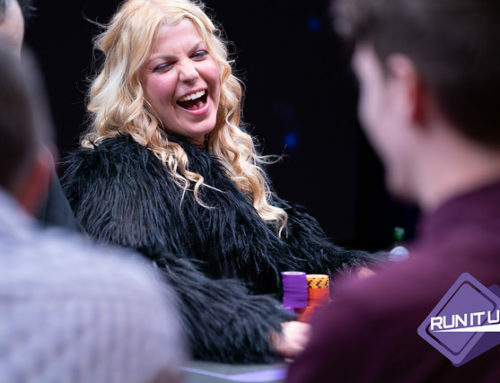 The $440 Mini Main Event kicked things off with Day 1A and boasts a guarantee of $100,000, double the amount that was put up in October’s series. The first of two flights brought in 127 entries, sending 26 hopefuls to move on to Day 2 on Sunday. Those not fortunate enough to find a bag can come back this afternoon to try again on Day 1B. 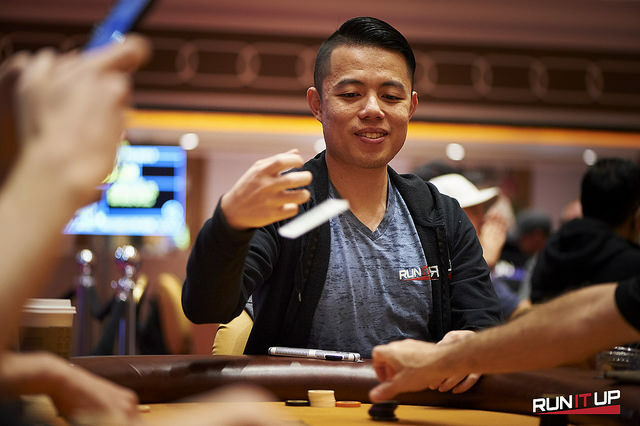 Team Run It Up Pro Ricky ‘RatedGTO’ Guan (pictured) built himself a top ten stack with 139,000 chips and is in prime position to hunt for his second piece of RIU gold. The high stakes poker player, Twitch streamer and commentator looks to dodge the booth and go all the way on Sunday. 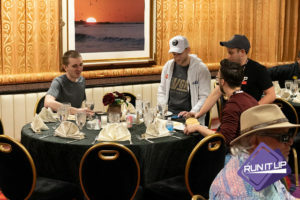 He is joined on Day 2 by the chip leader Alan Mastic (310,000) followed by familiar faces such as Andy Pokrivnak (242,000), Jesse Capps (194,000), Eric Nelson (94,000), Jesse Sylvia (85,000), Adam Owen (60,000), and Jordan Spurlin (39,500). 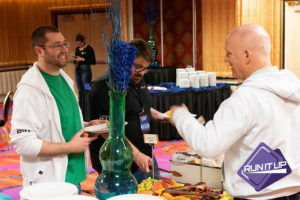 The much-anticipated $125 Short Deck Hold’em event fired up at 7:00 p.m. after dinner, and the room quickly filled up. 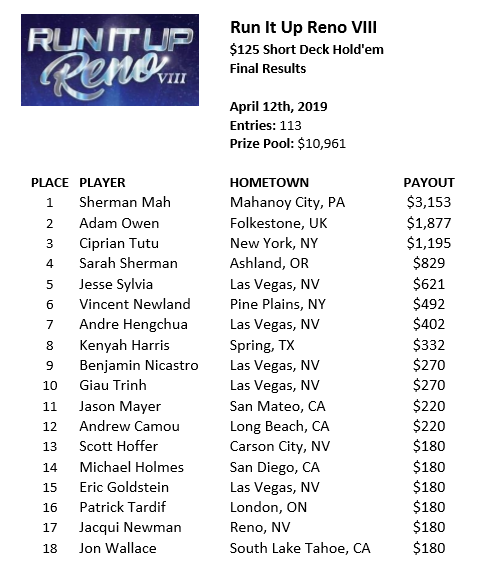 Once the Mini Main Event bagged for Day 2, most, if not all, of the remaining players registered for the side event, bringing the total entries to 113 in the second-ever Short Deck event at RIU Reno. 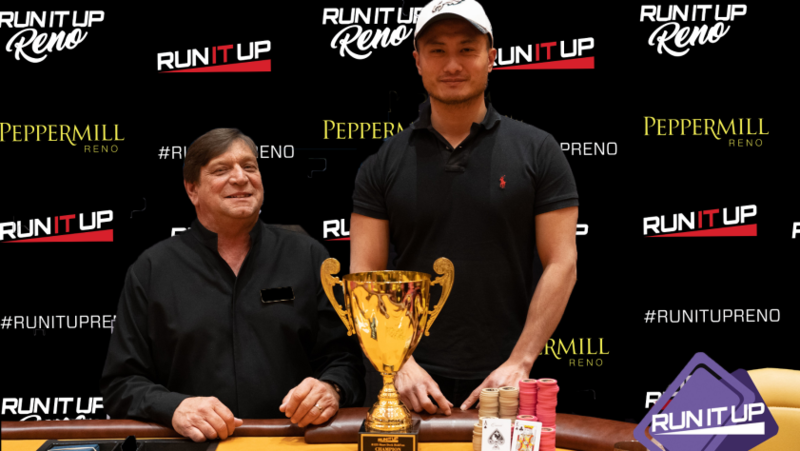 At the end of the day, it was Sherman Mah (pictured) who came up on top after defeating a stacked final table. 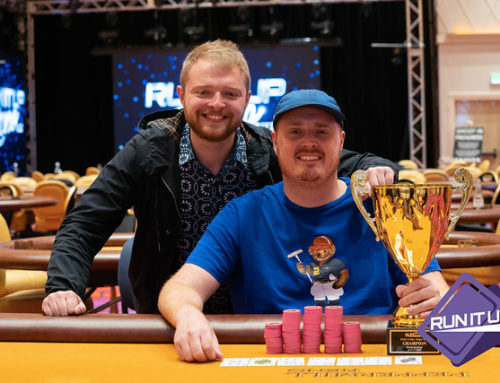 Mah pocketed $3,153 along with the coveted gold RIU trophy. 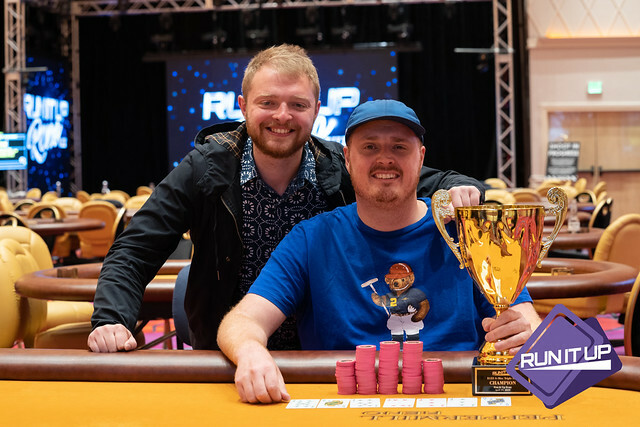 He lifted his new piece of hardware after eliminating his last opponent in Adam Owen, denying him his second RIU trophy. A total of 18 players made the money, all grabbing a piece of the $10,961 prize pool. 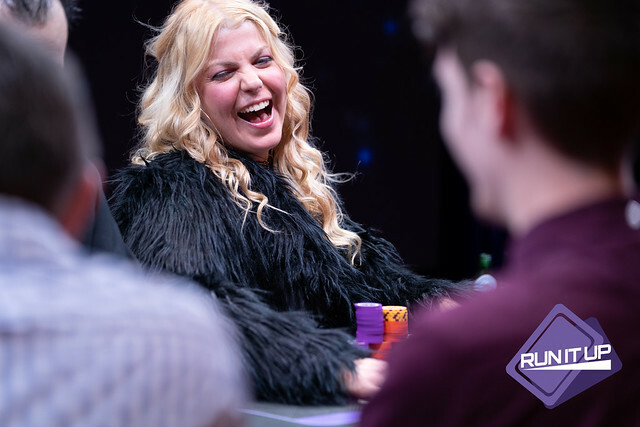 Familiar faces making it deep included Chip Tutu (3rd – $1,195), Sarah Sherman (4th – $829), Jesse Sylvia (5th – $621), Vincent Newland (6th – $492), Andre Hengchua (7th – $402), Andy Camou (12th – $220), Eric Goldstein (15th – $180) and Patrick Tardif (16th – $180). 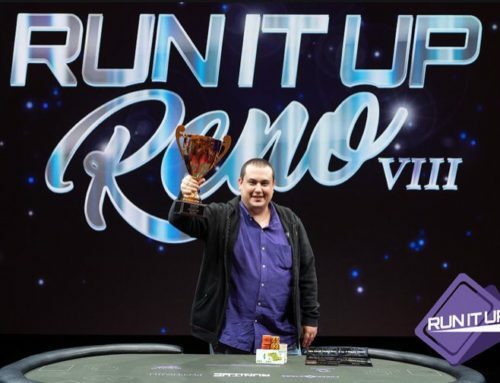 As always, there is much more to Run It Up Reno than poker. 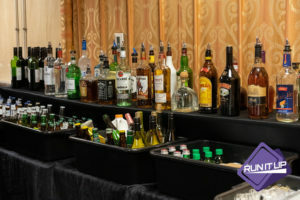 The opening day always includes the traditional Welcome Party, with a delicious spread of Turkey and Original burgers, a fruit and salad bar, as well as a sweet selection of desserts. 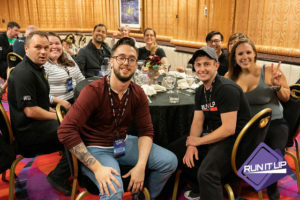 RIU Warriors reunited with old friends, but most certainly made new ones with a ton of fresh faces looking to get a taste of the contagious positive vibes that come guaranteed with the Run It Up brand. Live updates in the $440 Mini Main Event can be followed via PokerNews beginning at 12PM.